I will be signing books at this fair. There will be balloon animals and lots of great books. My signing is from 11 - 12. I will attend the third #nErDcampLI. nErD Camp is an "unconference" with a focus on literacy that is based on Nerd Camp MI & the Edcamp model. An "unconference" is a free, participant driven learning and networking experience. I will be leading sessions and signing books along with other author rock stars. I was part of an author panel talking about conversations in middle grade and young adult novels. Also featuring Gaetano J. Amato, Shawn Elizabeth George, Juliana Spink Mills, Liz Delton, and Steven Parlato! Thank you to those who came for a book talk, reading, activities, and a signing. A percentage of sales from anything bought in the store went to Riverside School. I had a great time attending the first #nErDcampNJ. nErD Camp is an "unconference" with a focus on literacy that is based on Nerd Camp MI & the Edcamp model. An "unconference" is a free, participant driven learning and networking experience. I will be leading sessions and signing books along with other author rock stars. I attended the annual New England Society of Children's Books Writers and Illustrators Conference in Springfield, MA, and ran peer critiques and signed copies of The Sweet Spot and The Perfect Trip. Thank you for bringing the family to my kid friendly launch party for The Perfect Trip. Food, games, and prizes were followed by a book signing. Diane's Books sold copies of The Perfect Trip at the event. This morning event was for students in third grade through 8th grade (drop off). There were authors, illustrators and book love celebrations including: break out sessions and a chance for students to participate in reading and writing workshops with real live mentor authors! (AKA KidLit Rockstars!!!!). My session was on Making the Ordinary Extraordinary. I worked with students in the third grader, running three writer's workshops and giving a group presentation. See my school visit page for information about author presentations. I attended the second #nErDcampLI. nErD Camp is an "unconference" with a focus on literacy that is based on Nerd Camp MI & the Edcamp model. An "unconference" is a free, participant driven learning and networking experience. I will be leading sessions and signing books along with other author rock stars. 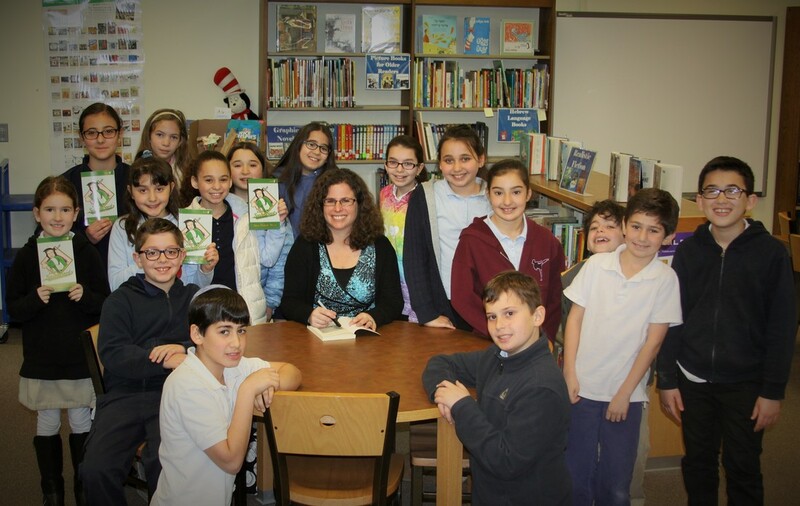 Thank you to the Staff and Friends of the Cos Cob Library for hosting an AuthorsLive for children with local resident, Stacy Barnett Mozer, author of THE SWEET SPOT. The book is intended for readers in 2nd-6th grades and is the story of thirteen-year-old Sam Barrette, the only girl playing in the 13U league. " She’s had to listen to boys and people in the stands screaming things like 'Go play softball' all season just because she’s a girl. " All stakes rest on Sam’s performance at baseball training camp but a miscommunication sets the week up for potential disaster. Placed at the bottom with the weaker players, she will have to work her way up to A league. Can Sam show her coach and prove to herself that she can hold a bat with the All-Star boys?" Stacy will read a couple of scenes from her book, speak about how she develops her characters and there will be a fun activity where kids can create their own! Books will be available for sale and signing. I participated in the 1st Nationwide Indie Author Day. Stop by the library to meet local authors, network and find your next favorite read. I presented about character along with Deborah Ann Davis, Liz Delton, Caragh M. O'Brien, and Padma Venkatraman. A book signing followed the event. I presented and signed books. I visited students in the fifth grade. Books were available before the visit through an order form provided by the school. I signed books for interested students. ​I visited students in the fifth grade. I spoke to students in the second - fifth grade. See my school visit page for information about author presentations. Books will be available before the visit through an order form provided by the school. I will be signing books for interested students. I worked with students in the third grade. See my school visit page for information about author presentations. This was a wonderful book fair. There were balloon animals, a Turkey Trot run, and picture book author Tracy Newman was also be there signing books. I signed my book from 11 - 11:30. I attended the first #nErDcampLI. According to their website, nErD Camp is an "unconference" with a focus on literacy that is based on Nerd Camp MI & the Edcamp model. An "unconference" is a free, participant driven learning and networking experience that is designed by you and includes the topics you want to discuss. During the first 30 minutes, the morning of the event, a session board is filled with different topics by the nErD Camp attendees. Participants are encouraged to vote with their feet and it is acceptable to move on if the session doesn't meet your needs or more likely there are 2 totally AWESOME sessions at the same time that you would like to experience. I signed books from 2:30 - 3:30 at the end of event.